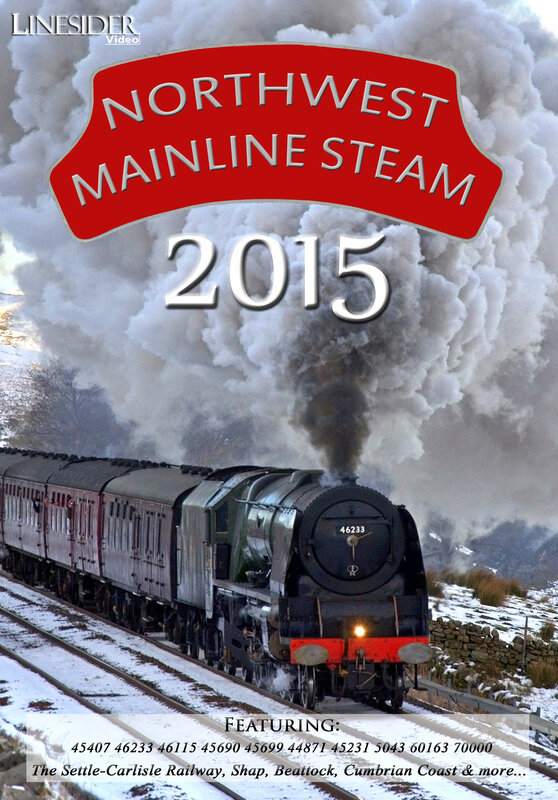 Northwest Mainline Steam 2015 is the latest in our successful series of films, and this year expanded into a bigger than ever release - culminating in a Double DVD, or single High Definition Blu-Ray. The film includes on-screen details of railtours, locations, dates, onboard speeds and gradients. As ever, a minimal commentary is timed to avoid conflict with the sounds of the locomotives. Also included are interesting changes and developments, including bridge demolition, signal replacement, and the construction of a new siding on the S&C. The film includes over 80 minutes of footage from the Settle-Carlisle Railway. Brock, Scout Green, Shap, Ais Gill, Garsdale (2). Lune Gorge (from an elevated position on Jeffrey's Mount), Shap Summit, Mallerstang (4). Extensive on-board footage from Appleby to Blackburn, including stunning sunset scenes. Kitson Wood Tunnel, Lydgate Viaduct, Darwen, Sough Tunnel. Scout Green, Shap Summit Cutting & Summit, Lowca, Parton, Duddon Estuary, Ulverston. Greenholme, Shap Summit - includes scenes of the small lineside fires/diesel pilot at Ais Gill on return. St. Bees (2), Foxfield, Lindal Tunnel. Hay Fell, Docker, Shap Wells, Low House, Armathwaite, Birkett Common, Mallerstang (2), Ais Gill Summit. Greskine, Harthope, leaving Beattock Summit (2), Abington (2), Craigenhill Summit, Cartland, Enterkinfoot, Drumlanrig Tunnel. Lodge Hall, Ais Gill Summit, Waitby Common, Birkett Common, Mallerstang-Ais Gill. App. Ramsgreave and Wilpshire, Barton & Broughton Loop. Ribblehead, Blea Moor Tunnel, Nr. Clitheroe, Whalley Arches, Langho, Wilpshire Tunnel, Wilpshire Summit, Barton & Broughton, Brock (2), Claughton (2). Gregson Lane (2), Whalley, Hellifield, Horton Station, Selside, Selside Shaw (2), Lodge Hall, Dent Head, Arten Gill, Thrimby, App. Shap, Shap, Shap Summit, Lune Gorge, Carlisle Bridge (Lancaster), Lancaster Station, Ripley Bank, Forton, Scorton. Settle Station, long-running sequence (Selside - Rise Hill) including multiple camera angles, close-in and fellside view points - hear the train in Blea Moor Tunnel from the ventilation shafts! Catterall, Barton, Brownhill, Wilpshire Summit, Gisburn, Newsholme, Helwith Bridge (including on-going footage of work on the new quarry connection), Lodge Hall, Eden Brows Wood, Armathwaite, Birkett Common, Birkett Tunnel, Ais Gill, Dentdale, Billington, Langho, Brock. 45699: Ulverston, Park South, Nethertown, Aspatria Climb, Howe & Co's Siding, Birkett Common. Selside, Lodge Hall (slipping), Great Strickland, Shap Summit. Blea Moor (2) - the last northbound steam-hauled train to be signalled by semaphore at Blea Moor. Clapham (3) - bursting from the mist into the early morning sun, Gargrave (2)/ returning - Skipton, Giggleswick Bank (2). Hayfell, Mosedale Hall (Grayrigg), Ribblehead - includes footage of the demolition of Bridge 64 on the S&C, at Gauber. Starrick's Farm, Keer Holme, Leaving Bentham, Nr. Bentham, Hellifield/return - Hellifield, Giggleswick Bank in the moonlight. On 5th December, 45699 was scheduled to haul the Cathedrals Explorer to Appleby, but in the event, Storm Desmond conspired to close all of the lines north of Carnforth, including Shap and the S&C. We close with scenes showing the extreme weather at Shap and Tebay.